flocked to the South Bank site, to wander around the Dome of Discovery, gaze at the Skylon, and generally enjoy a festival of national celebration. Up and down the land, lesser festivals enlisted much civic and voluntary enthusiasm. A people curbed by years of total war and half-crushed by austerity and gloom, showed that it had not lost the capacity for enjoying itself....Above all, the Festival made a spectacular setting as a showpiece for the inventiveness and genius of British scientists and technologists. Labour cabinet member Herbert Morrison was the prime mover; in 1947 he started with the original plan to celebrate the centennial of the Great Exhibition of 1851. 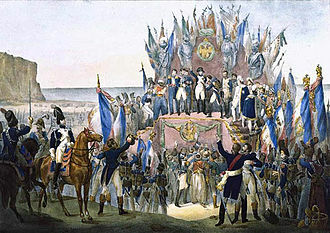 However it was not to be another World Fair, for international themes were absent, as was the British Commonwealth. Instead the 1951 festival focused entirely on Britain and its achievements; it was funded chiefly by the government, with a budget of £12 million. The Labour government was losing support and so the implicit goal of the festival was to give the people a feeling of successful recovery from the war's devastation , as well as promoting British science, technology, industrial design, architecture and the arts. The Festival's centrepiece was in London on the South Bank of the Thames. There were events in Poplar (Architecture), Battersea (The Festival Pleasure Gardens), South Kensington (Science) and Glasgow (Industrial Power). Festival celebrations took place in Cardiff, Stratford-upon-Avon, Bath, Perth, Bournemouth, York, Aldeburgh, Inverness, Cheltenham, Oxford, Norwich, Canterbury and elsewhere and there were touring exhibitions by land and sea. clean, bright and new.... It caught hold quickly and spread first across London and then across England....In an island hitherto largely given up to gravy browns and dull greens, "Contemporary" boldly espoused strong primary colors. 3.1 Upstream Circuit: "The Land"
3.3 Downstream Circuit: "The People"
A view of the South Bank Exhibition from the north bank of the Thames, showing the 300-foot tall Skylon and the Dome of Discovery. 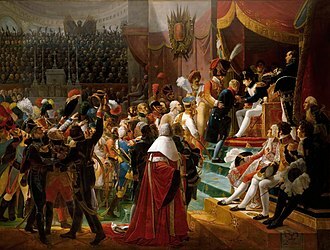 The first idea for an exhibition in 1951 came from the Royal Society of Arts in 1943, which considered that an international exhibition should be held to commemorate the centenary of the 1851 Great Exhibition. In 1945, the government appointed a committee under Lord Ramsden to consider how exhibitions and fairs could promote exports. When the committee reported a year later, it was decided not to continue with the idea of an international exhibition because of its cost at a time when reconstruction was a high priority. Herbert Morrison took charge for the Labour government and decided instead to hold a series of displays about the arts, architecture, science, technology and industrial design, under the title "Festival of Britain 1951". Morrison insisted there be no politics, explicit or implicit. As a result Labour-sponsored programs such as nationalisation, universal health care and working class housing were excluded; instead what was allowed was town planning, scientific progress, and all sorts of traditional and modern arts and crafts. Much of London lay in ruins and models of redevelopment were needed. The Festival was an attempt to give Britons a feeling of recovery and progress and to promote better-quality design in the rebuilding of British towns and cities. The Festival of Britain described itself as "one united act of national reassessment, and one corporate reaffirmation of faith in the nation's future." Gerald Barry, the Festival Director, described it as "a tonic to the nation". 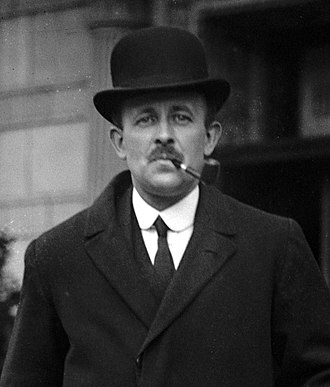 A Festival Council to advise the government was set up under General Lord Ismay. Responsibility for organisation devolved upon the Lord President of the Council, Herbert Morrison, the deputy leader of the Labour Party, who had been London County Council leader. He appointed a Great Exhibition Centenary Committee, consisting of civil servants, who were to define the framework of the Festival and to liaise between government departments and the festival organisation. In March 1948, a Festival Headquarters was set up, which was to be the nucleus of the Festival of Britain Office, a government department with its own budget. Festival projects in Northern Ireland were undertaken by the government of Northern Ireland. Associated with the Festival of Britain Office were the Arts Council of Great Britain, the Council of Industrial Design, the British Film Institute and the National Book League. In addition, a Council for Architecture and a Council for Science and Technology were specially created to advise the Festival Organisation and a Committee of Christian Churches was set up to advise on religion. Government grants were made to the Arts Council, the Council of Industrial Design, the British Film Institute and the National Museum of Wales for work undertaken as part of the Festival. Gerald Barry had operational charge. A long-time editor with left-leaning, middle-brow views, he was energetic and optimistic, with an eye for what would be popular, and a knack on how to motivate others. Unlike Morrison, Barry was not seen as a Labour ideologue. Barry selected the next rank, giving preference to young architects and designers who had collaborated on exhibitions for the wartime Ministry of Information. They thought along the same lines socially and aesthetically, as middle-class intellectuals with progressive sympathies. Thanks to Barry a collegial sentiment prevailed that minimised stress and delay. The arts were displayed in a series of country-wide musical and dramatic performances. Achievements in architecture were to presented in a new neighbourhood, the Lansbury Estate, planned, built and occupied in the Poplar district of London. The Festival's centrepiece was the South Bank Exhibition, in the Waterloo area of London, which demonstrated the contribution made by British advances in science, technology and industrial design, displayed, in their practical and applied form, against a background representing the living, working world of the day. There were other displays elsewhere, each intended to be complete in itself, yet each part of the one single conception. Festival Pleasure Gardens were set up in Battersea, about three miles up river from the South Bank. Heavy engineering was the subject of an Exhibition of Industrial Power in Glasgow. Certain aspects of science, which did not fall within the terms of reference of the South Bank Exhibition, were displayed in South Kensington. Linen technology and science in agriculture were exhibited in "Farm and Factory" in Belfast. A smaller exhibition of the South Bank story was put on in the Festival ship Campania, which toured the coast of Britain throughout the summer of 1951, and on land there was a travelling exhibition of industrial design. The University of Brighton Design Archives have digitised many of the Design Council's files relating to the planning of the festival. Construction of the South Bank site opened up a new public space, including a riverside walkway, where previously there had been warehouses and working-class housing. The layout of the South Bank site was intended to showcase the principles of urban design that would feature in the post-war rebuilding of London and the creation of the new towns. These included multiple levels of buildings, elevated walkways and avoidance of a street grid. Most of the South Bank buildings were International Modernist in style, little seen in Britain before the war. The theme of the Exhibition was devised by Ian Cox. The Exhibition comprised the Upstream Circuit: "The Land", the Dome of Discovery, the Downstream Circuit: "The People", and other displays. Telecinema. (Architect: Wells Coates. Programme and Presentation: J. D. Ralph and R. J. Spottiswoode. An unusual cigar-shaped aluminium-clad steel tower supported by cables, the Skylon was the “Vertical Feature” that was an abiding symbol of the Festival of Britain. The base was nearly 15 metres (50 feet) from the ground, with the top nearly 90 metres (300 feet) high. The frame was clad in aluminium louvres lit from within at night. It was designed by Hidalgo Moya, Philip Powell and Felix Samuely, and fabricated by Painter Brothers of Hereford, England, between Westminster Bridge and Hungerford Bridge. It had a steel latticework frame, pointed at both ends and supported on cables slung between three steel beams. The partially constructed Skylon was rigged vertically, then grew taller in situ. The architects' design was made possible by the engineer Felix Samuely who, at the time, was a lecturer at the Architectural Association School of Architecture in Bedford Square, Bloomsbury. The Skylon was scrapped in 1952 on the orders of Winston Churchill, who saw it as a symbol of the preceding Labour Government. 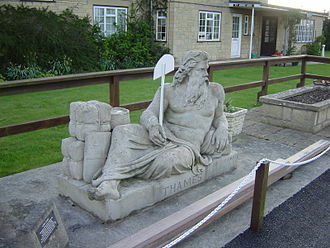 It was demolished and sold for scrap after being toppled into the Thames. Designed by Leslie Martin, Peter Moro and Robert Matthew from the LCC's Architects' Department and built by Holland, Hannen & Cubitts for London County Council. 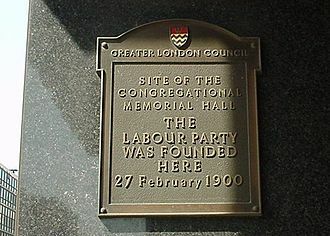 The foundation stone was laid by Prime Minister Clement Attlee 1949 on the site of the former Lion Brewery, built in 1837. Martin was 39 when he was appointed to lead the design team in late 1948. He designed the structure as an 'egg in a box', a term he used to describe the separation of the curved auditorium space from the surrounding building and the noise and vibration of the adjacent railway viaduct. Sir Thomas Beecham used similar imagery, calling the building a "giant chicken coop". The building was officially opened on 3 May 1951. 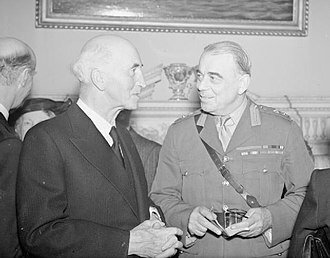 The inaugural concerts were conducted by Sir Malcolm Sargent and Sir Adrian Boult. In April 1988 it was designated a Grade I listed building, the first post-war building to become so protected. The Festival Administration Building, by Maxwell Fry, Jane Drew and Edward Mills. An amusement park which would outlast the other entertainments. It become 'Battersea Fun Fair and stayed open until the mid-1970s. A "West End" Restaurant with a terrace overlooking the river and facing Cheyne Walk. A wine garden surrounded by miniature pavilions. A wet weather pavilion with a stage facing two ways so that performances could take place in the open air. It had murals designed by the film set designer Ferdinand Bellan. An amphitheatre seating 1,250 people, featuring the music hall star Lupino Lane and his company on its opening. It was and later made into a circus. The majority of the buildings and pavilions on the site were designed by John Piper. There was also a whimsical Guinness Festival Clock resembling a three dimensional version of a cartoon drawing. The Pleasure Gardens received as many visitors as the South Bank Festival. They were managed by a specially-formed private company financed by loans from the Festival Office and the London County Council. As the attractions failed to cover their costs, it was decided to keep them open after the rest of the Festival had closed. The Festival architects tried to show by the design and layout of the South Bank Festival what could be achieved by applying modern town planning ideas. The Festival Style, (also called "Contemporary") combining modernism with whimsy and Englishness, influenced architecture, interior design, product design and typography in the 1950s. William Feaver describes the Festival Style as "Braced legs, indoor plants, lily-of-the valley sprays of lightbulbs, aluminium lattices, Costswold-type walling with picture windows, flying staircases, blond wood, the thorn, the spike, the molecule." The influence of the Festival Style was felt in the new towns, coffee bars and office blocks of the fifties. Harlow new town and the rebuilding of Coventry city centre are said to show the influence of the Festival Style "in their light structures, picturesque layout and incorporation of works of art", and Coventry Cathedral (1962), designed by Basil Spence, one of the Festival architects, was dubbed "The Festival of Britain at Prayer". There was an exhibition about building research, town planning and architecture, the "Live architecture" exhibit of buildings, open spaces and streets in the Lansbury Estate, Poplar (named after the former Labour Party leader George Lansbury. Plans for social housing in the area had commenced in 1943. By the end of the war nearly a quarter of the buildings in the area had been destroyed or badly damaged. In 1948, the Architecture Council decided that the Poplar site would make a good exhibition partly because it was near to the other Festival exhibitions. Despite funding problems, work began in December 1949 and by May 1950 was well advanced. The wet winter of 1950–51 delayed work, but the first houses were completed and occupied by February 1951. The exhibition opened on 3 May 1951 along with the other Festival exhibitions. Visitors first went to the Building Research Pavilion, which displayed housing problems and their solutions, then to the Town Planning Pavilion, a large, red-and-white striped tent. The Town Planning Pavilion demonstrated the principles of town planning and the urgent need for new towns, including a mock up of an imaginary town called "Avoncaster". Visitors then saw the buildings of the Lansbury Estate. Attendance was disappointing, only 86,426 people visiting, compared to 8 million who visited the South Bank exhibition. Reaction to the development by industry professionals was lukewarm, some criticising its small scale Subsequent local authorities concentrated on high rise, high density social housing rather than the Lansbury estate model. The estate remains popular with residents. Among the remaining 1951 buildings are Trinity Independent Chapel, and The Festival Inn and Festive Briton (now Callaghans) pubs. Misha Black, one of the Festival architects, said that the Festival created a wide audience for architectural modernism but that it was common currency among professional architects that the design of the Festival was not innovative. The design writer Reyner Banham has questioned the originality and the Englishness of the Festival Style and indeed the extent of its influence. Young architects in 1951 are said to have despised the Festival of Britain for its architecture. "It was equated with the ‘Contemporary Style’, and an editorial on New Brutalism in Architectural Design in 1955 carried the epigraph, ‘When I hear the word “Contemporary” I reach for my revolver.’"
The Royal Festival Hall, showing the lettering designed for the South Bank Exhibition by the Festival typography panel. The South Bank Exhibition included a Design Review that presented "an illustrated record of contemporary achievement in British industry", showing "the high standard of design and craftsmanship that has been reached in a wide range of British products." The exhibits were based on the stock list of the Council of Industrial Design (CoID) and were chosen for appearance, finish, workmanship, technical efficiency, fitness for purpose and economy of production. In selecting and promoting designs in this way, the Festival was an influential advocate of the concept of "Good Design", a rational approach to product design in accordance with the principles of the Modern Movement. Its advocacy of Good Design had grown partly out of the standards of utility furniture created during the war (Gordon Russell, the Director of the CoID, had been Chairman of the Utility Furniture Design Panel) and partly out of the CoID's Britain Can Make It exhibition of 1946. The CoiD's stock list was retained and inherited by its successor, the Design Council. Lettering and type design featured prominently in the graphic style of the Festival and was overseen by a typography panel including the lettering historian Nicolete Gray. A typeface for the Festival, Festival Titling, was specially commissioned and designed by Philip Boydell. It was based on condensed sans-serif capitals and had a three-dimensional form making it suitable for use in exhibition display typography. It has been said to bear "a vague resemblance to bunting". The lettering on the Royal Festival Hall and the temporary Festival building on the South Bank was a bold, sloping slab serif letter form, determined by Gray and her colleagues, including Charles Hasler and Gordon Cullen, illustrated in Gray’s Lettering on Buildings (1960) and derived in part from typefaces used in the early 19th century. It has been described as a "turn to a jauntier and more decorative visual language" that was "part of a wider move towards the appreciation of vernacular arts and the peculiarities of English culture". The lettering in the Lion and Unicorn Pavilion was designed by John Brinkley. The graphic designer for the Festival was Abram Games, who created its emblem, the Festival Star. The South Bank Exhibition showed the work of contemporary artists such as William Scott, including murals by Victor Pasmore, John Tunnard, Feliks Topolski, Barbara Jones, and John Piper and sculptures by Barbara Hepworth, Henry Moore, Lynn Chadwick, Jacob Epstein and Reg Butler. "An Exhibition of Exhibitions", Royal Society of the Arts. Two exhibitions at the Whitechapel Art Gallery: "Black Eyes and Lemonade" and "East End 1851". Barbara Jones and Tom Ingram organised "Black Eyes and Lemonade", an exhibition of British popular and traditional art, in association with the Society for Education in Art and the Arts Council. In the same year she surveyed the popular arts in her influential book, The Unsophisticated Arts, which included taxidermy, fairgrounds, canal boats, seaside, riverside, tattooing, the decoration of food, waxworks, toys, rustic work, shops, festivals and funerals. She said of the popular arts," some of it is made for themselves by people without professional training in the arts or in the appreciation of them, and some of it has been made for those people by professionals who work to their taste." The Festival was the occasion of the first performance of steelpan music in Britain by the Trinidad All Steel Percussion Orchestra. "Forward a Century", sponsored by the Petroleum Films Bureau. Several feature films were planned, but only one was completed in time, namely The Magic Box, a biopic concerning pioneer William Friese-Greene, made by Festival Film Productions. There was a purpose-built film theatre on the South Bank, the Telecinema (sometimes called the "Telekinema"), designed by Wells Coates, which showed documentary and experimental film exploiting stereophony and stereoscopy and the new invention of television. It was one of the most popular attractions of the Festival, with 458,693 visitors. When the Festival ended, the Telecinema was handed over to the BFI for use as a members-only repertory cinema club, re-opening in 1952 as the National Film Theatre. 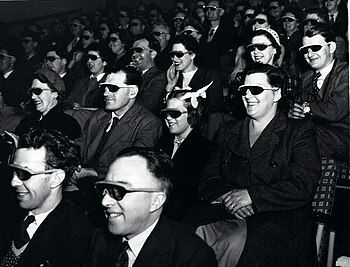 Film was integral to the South Bank Exhibition, used to explain manufacturing, science and technology. The Dome of Discovery, the Exhibition of Science in South Kensington and the travelling Festival Exhibition made extensive use of educational and explanatory film. Film festivals, including those at Edinburgh Film Festival, Bath and Glasgow participated in the Festival of Britain, and local authorities put on film festivals, helped by a BFI pamphlet, How to put on a Film Show. Commercial cinema chains and independent cinemas also joined in, the Gaumont and Odeon chains programming seasons of British films. "And finally, if the Festival visitor had not tired of the medium, they could purchase colour 16mm film of Britain’s historic buildings and pageantry and filmstrips of the Festival of Britain and London as souvenirs." A new wing was built for the Science Museum to hold the Exhibition of Science. The first part of the exhibition showed the physical and chemical nature of matter and the behaviour of elements and molecules. The second part, "The Structure of Living Things", dealt with plants and animals. The third part, "Stop Press", showed some of the latest topics of research in science and their emergence from the ideas illustrated in the earlier sections of the exhibition. They included "the penetrating rays which reach us from outer space, what goes on in space and in the stars, and a range of subjects from the electronic brain to the processes and structures on which life is based." The selection of Trowell, a Nottinghamshire village in the middle of England, as the Festival Village. The re-design of Parliament Square by George Grey Wornum in preparation for the Festival of Britain year. Commemorative postage stamps and many souvenirs, official and unofficial. A commemorative crown coin (presented with a certificate in either a red or green presentation box), The crown coin featured on its reverse the St. George and the Dragon design by Benedetto Pistrucci, best known for its place on British Sovereign coins. The certificate states "The first English Silver Crown piece was minted in 1551. Four hundred years later, on the occasion of the Festival of Britain, the Royal Mint has issued a Crown piece, bearing on its edge the Latin inscription MDCCCLI CIVIUM INDUSTRIA FLORET CIVITAS MCMLI-1951 By the industry of its people the State flourishes 1951". The first performance of Robert McLellan's play Mary Stewart at the Glasgow Citizens Theatre. An exhibition about Sherlock Holmes (part of which is now owned by Westminster Libraries and part by the Sherlock Holmes pub). The Festival was highly popular in every part of Britain. Richard Weight estimates that of the national population of 49 million, about half participated. The Festival largely ignored foreign tourists, with most of the visitors from the Continent being expatriate Britons. There were over ten million paid admissions to the six main exhibitions over a period of five months: The most popular event was the centerpiece at South Bank Exhibition with almost 8.5 million visitors, over half of them from outside London. The Festival Pleasure Gardens had over 8 million visitors, three-quarters of them from London. The Festival Ship Campania, which docked in ten cities, was visited by almost 900,000 people. The Travelling Land Exhibition, which went to four English cities, attracted under half a million. The most specialised events, in terms of attracting few visitors, were the architecture exhibition in Poplar, with 87,000 visitors and the exhibition of books in South Kensington, with 63,000. The idea of holding the Festival became a party political issue. Although Herbert Morrison said that he did not want the Festival to be seen as a political venture, it became associated with the Labour Party, which had won the 1950 general election, and it was opposed by the Conservative Party. Hugh Casson said that, "Churchill, like the rest of the Tory Party, was against the Festival which they (quite rightly) believed was the advanced guard of socialism." Churchill referred to the forthcoming Festival of Britain as "three-dimensional Socialist propaganda." In an essay on the Festival, Michael Frayn characterised it as an enterprise of "the radical middle-classes, the do-gooders; the readers of the News Chronicle, The Guardian, and The Observer; the signers of petitions; the backbone of the B.B.C.," whom he called "Herbivores". In Frayn's view, "The Festival was the last, and virtually the posthumous, work of the Herbivore Britain of the BBC News, the Crown Film Unit, the sweet ration, the Ealing comedies, Uncle Mac, Sylvia Peters." In making the Festival the Herbivores "earned the contempt of the Carnivores – the readers of the Daily Express; the Evelyn Waughs; the cast of the Directory of Directors". Some prominent members of the Labour government considered the Festival to be a Labour undertaking which would contribute to their future electoral success, and Clement Attlee, the Labour Leader, wrote to Morrison saying that an election in autumn 1951 would enable the Labour Party to benefit from its popularity. In the event, Labour lost the autumn election. Churchill's contempt for the Festival led him to make his first act as Prime Minister in October 1951 an instruction to clear the South Bank site. The Guide Book to the Festival described its legacy in these words: "It will leave behind not just a record of what we have thought of ourselves in the year 1951 but, in a fair community founded where once there was a slum, in an avenue of trees or in some work of art, a reminder of what we have done to write this single, adventurous year into our national and local history." While the idea of the Festival was being worked out, the government and the London County Council were at the same time planning the redevelopment of the South Bank site, including "a number of great buildings, which will form part of a co-ordinated design." The first of these was the Royal Festival Hall. The Festival hastened the reclamation of four and a half acres of land from the river, which "transformed the familiar patchwork of rubble and half-derelict buildings which had for so long monopolised the propect from the North Bank". The Festival site was, over the following thirty years, developed into the South Bank Centre, an arts complex comprising the Royal Festival Hall, the National Film Theatre, the Queen Elizabeth Hall, the Purcell Room and the National Theatre. A 1951 office building at 219 Oxford Street, London, designed by Ronald Ward and Partners (now a Grade II* listed building), incorporates images of the Festival on its facade. The Festival cost about £10.5 million, (apart from the loans for the Festival Gardens) with revenues of about £2.5m. The net cost was £8 million (equivalent to £247 million today). In 1953 the Festival of Britain Office was abolished and its records were taken over by the Ministry of Works. As well as the material legacy, the Festival gave rise to new traditions, in particular the performances of medieval mystery plays in York and Chester. There was an explosion of interest in these plays, regular performance of which have continued in those cities ever since. Several images of the South Bank Exhibition can be found on the internet, including many released by The National Archives on the 60th anniversary of the festival. A filmed retrospective of the South Bank Exhibition, Brief City (1952), with special reference to design and architecture, was made by Richard Massingham for The Observer newspaper. A film comedy, The Happy Family, was made about working-class resistance to the demolition that the festival required. The Festival is featured in the early portion of the film Prick up your Ears. The archive of the Design Council held at the University of Brighton Design Archives includes several hundred images of the festival. They can be searched via the Visual Arts Data Service (VADS). ^ Eric Nahm. (1992). Britain Since 1945: The People's Peace. Oxford UP. p. 111. ^ Bernard Donoughue, and G. W. Jones, Herbert Morrison: Portrait of a Politician (1973), pp 492-95. ^ DK Publishing (2011). History of Britain and Ireland. p. 361. ^ a b c d The Festival of Britain (Official Book of the Festival of Britain 1951). HMSO, 1951. ^ Barry Turner, Beacon for Change: How the 1951 Festival of Britain Shaped the Modern Age (2011). ^ Harry Hopkins, The New Look: A social history of the Forties and Fifties in Britain ( 1963) pp 271-72. ^ a b c d e f ""Circa 1951: Presenting Science to the British Public", Robert Anderson, Oregon State University". Osulibrary.oregonstate.edu. Archived from the original on 6 July 2008. Retrieved 13 December 2011. ^ a b c d e "The National Archives". The National Archives. Retrieved 13 December 2011. ^ a b "V&A, ''Designing Britain''". Vads.ac.uk. Retrieved 13 December 2011. ^ F.M. Leventhal, "'A Tonic to the Nation': The Festival of Britain, 1951." Albion 27#3 (1995): 445-453. ^ Peter Newman, and Ian Smith, "Cultural production, place and politics on the South Bank of the Thames." International Journal of Urban and Regional Research 24.1 (2000): 9-24. ^ Sophie Forgan, "Festivals of science and the two cultures: science, design and display in the Festival of Britain, 1951." British Journal for the History of Science 31#2 (1998): 217-240. ^ Henrietta Goodden, The Lion and the Unicorn: symbolic architecture for the Festival of Britain 1951 (Norwich, Unicorn Press, 2011). ^ Henry Grant. "The Skylon in construction". Museum of London. Archived from the original (photo) on 30 July 2013. ^ "Skyscraper news". Skyscraper news. 19 February 2000. Retrieved 13 December 2011. ^ "Hansard". Hansard.millbanksystems.com. 5 February 1952. Retrieved 13 December 2011. ^ The Festival of Britain – Building the Future Archived 13 February 2009 at the Wayback Machine. Retrieved 1 April 2007. ^ The Times, 21 November 1950, p. 6. ^ The Times, 5 May 1951, p. 4. ^ "''The Riverside Theatre, Festival Pleasure Gardens, Battersea Park, London''". Arthurlloyd.co.uk. Retrieved 13 December 2011. ^ "Treasury Historical Memorandum No.2". Archive.treasury.gov.uk. 8 March 1951. Archived from the original on 25 November 2011. Retrieved 13 December 2011. ^ a b Powers, Alan (29 June 2011). "Powers, A., "Sixty years on from the Festival of Britain", ''Architectural Review'', 22 June 2011". Architectural-review.com. Retrieved 13 December 2011. ^ "English Heritage, ''PastScape'', "The Festival of Britain: 60th anniversary"". 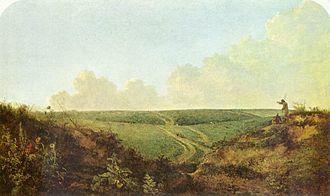 Pastscape.org.uk. 3 May 1951. Retrieved 13 December 2011. ^ a b c d "The Lansbury Estate". University of London & History of Parliament Trust. Retrieved 1 September 2009. ^ A. W. Cleeve Barr. Public Authority Housing. p. 175. OCLC 3780558. ^ "The Wellcome Collection". The Wellcome Collection. Retrieved 13 December 2011. ^ a b http://www.ae-pro.com. "Kinross, R., "The Royal Festival hall has regained the thoroughly English lettering of its origins in the Festival of Britain – on one side only", ''Eye'', No.65". Eyemagazine.com. Retrieved 13 December 2011. ^ "Monotype Imaging". Fonts.com. Retrieved 13 December 2011. ^ "Typography at the Festival of Britain". Wharferj.wordpress.com. 8 June 2011. Retrieved 13 December 2011. ^ "Kinross, R., ''Signs at the Royal Festival Hall''". Hyphenpress.co.uk. Retrieved 13 December 2011. ^ "University of Brighton Faculty of Arts, ''Design Archives material at Festival Hall''". Arts.brighton.ac.uk. 18 April 2011. Retrieved 13 December 2011. ^ ''Life'', Vol.30 No.4, January 22, 1951. Google Books. 22 January 1951. Retrieved 13 December 2011. ^ a b "The Festival of Britain, 1951', Mapping the Practice and Profession of Sculpture in Britain and Ireland 1851–1951, University of Glasgow History of Art and HATII, online database 2011". Sculpture.gla.ac.uk. 31 December 1949. Retrieved 13 December 2011. ^ "York Mystery Plays site". Yorkmysteryplays.org. Retrieved 13 December 2011. ^ East End 1851: a Festival of Britain exhibition by arrangement with the Arts Council, 1951, Whitechapel Art Gallery. ^ Featherstone, S., ''Englishness: Twentieth Century Popular Culture and the Forming of English Identity'', 2009, Edinburgh University Press. Google Books. Retrieved 13 December 2011. ^ "Ash Rare Books". Ashrare.com. Retrieved 13 December 2011. ^ Panqueen. "TASPO – Sterling Betancourt – The 1951 Festival of Britain". Youtube. Retrieved 13 December 2011. ^ a b c d "Sarah Easen, Film and the Festival of Britain 1951, British Universities and Video Council". Bufvc.ac.uk. Retrieved 13 December 2011. ^ Family Portrait - A Film on the Theme of the Festival of Britain 1951. Wessex Film. 1950. ^ "The Museum of London". The Museum of London. Archived from the original on 30 July 2013. Retrieved 13 December 2011. ^ "BBC News – 'Festival village' Trowell marks 60th anniversary". BBC. 22 April 2011. Retrieved 13 December 2011. ^ "London Garden Online". Londongardensonline.org.uk. 29 August 2007. Retrieved 13 December 2011. ^ "The Festival of Britain". Museum of London. 31 August 2001. Retrieved 13 December 2011. ^ "Festival of Britain". Oldcopper.org. Archived from the original on 5 December 2011. Retrieved 13 December 2011. ^ "Crown Story". 24carat.co.uk. Retrieved 13 December 2011. ^ Ian Campbell and Ronald Jack (eds), Jamie the Saxt, London, Calder and Boyars, 1970, p.154. ^ "Westminster Online". Westminster Online. Retrieved 13 December 2011. ^ Richard Weight, Patriots: National Identity in Britain 1940–2000 (2002) p 205. ^ "Festival of Britain". Packer34.freeserve.co.uk. Archived from the original on 24 December 2011. Retrieved 13 December 2011. ^ a b Frayn, Michael (3 May 2001). "Festival Spirit". The Guardian. UK. Retrieved 13 December 2011. (Extract from Sissons, Michael; French, Philip, eds. (1963). The Age of Austerity, 1945-1951. London: Hodder & Stoughton. 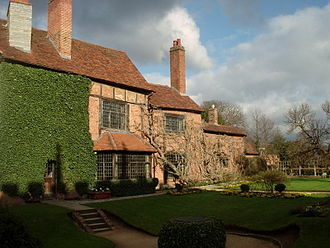 ^ Historic England. "Monument No. 1541497". PastScape. Retrieved 13 December 2011. 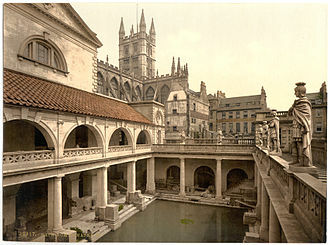 ^ "Bristol University Theatre Collection". Bristol.ac.uk. 21 July 2010. Archived from the original on 18 December 2011. Retrieved 13 December 2011. ^ "Festival of Britain Showcase". The National Archives. Retrieved 13 December 2011. ^ "''Brief City''". Archive.org. Retrieved 13 December 2011. Atkinson, Harriet. The Festival of Britain: A land and its People (IB Tauris, 2012). Casey, Andrew. "Ceramics at the Festival of Britain 1951: Selection and Objection." Journal of the Decorative Arts Society 1850-the Present 25 (2001): 74-86. Clark, Adrian. British and Irish Art, 1945-1951: From War to Festival (Paul Holberton Pub, 2010). Conekin, Becky. The Autobiography of a Nation: The 1951 Exhibition of Britain, Representing Britain in the Post-War World (Manchester UP, 2003). Goodden, Henrietta. The Lion and the Unicorn: symbolic architecture for the Festival of Britain 1951 (Norwich, Unicorn Press, 2011), 144 pp. Hillier, Bevis, and Mary Banham, eds. A Tonic to the Nation: The Festival of Britain: 1951 (Thames and Hudson, 1976). Hoon, Will. The 1951 Festival of Britain: A Living Legacy (Department of History of Art and Design, Manchester Metropolitan University, 1996). Lew, Nathaniel G. Tonic to the Nation: Making English Music in the Festival of Britain (Routledge, 2016). Richardson, R. C. "Cultural Mapping in 1951: The Festival of Britain Regional Guidebooks" Literature & History 24#2 (2015) pp 53-72. Turner, Barry. Beacon for change. How the 1951 Festival of Britain shaped the modern age (London, Aurum Press, 2011). Weight, Richard. Patriots: National Identity in Britain, 1940–2000 (London: Pan Macmillan, 2013), pp 193-208. Wilton, Iain. "‘A galaxy of sporting events’: sport’s role and significance in the Festival of Britain, 1951." Sport in History 36#4 (2016): 459-476. Wikimedia Commons has media related to Festival of Britain. "Festival of Britain Set". Flickr. University of Brighton Design Archives. Stratford-upon-Avon is a market town and civil parish in Warwickshire, England, on the River Avon,101 miles north west of London,22 miles south east of Birmingham, and 8 miles south west of Warwick. The estimated population in 2007 was 25,505, increasing to 27,445 at the 2011 Census, Stratford was originally inhabited by Anglo-Saxons and remained a village before lord of the manor, John of Coutances, set out plans to develop it into a town in 1196. In that same year, Stratford was granted a charter from King Richard I to hold a market in the town. As a result, Stratford experienced an increase in trade and commerce as well as urban expansion, the town is a popular tourist destination owing to its status as birthplace of English playwright and poet William Shakespeare, and receives approximately 2.5 million visitors a year. The Royal Shakespeare Company resides in Stratfords Royal Shakespeare Theatre, the street was a Roman road which connected Icknield Street in Alcester to the Fosse Way. The ford, which has used as a crossing since Roman times. A survey of 1251-52 uses the name Stratford for the first time to identify Old Stratford, the name was used after that time to describe the area specifically surrounding the Holy Trinity Church and the street of Old Town. The settlement which became known as Stratford was first inhabited by Anglo-Saxons following their 7th century invasion of what would become known as Warwickshire. The land was owned by the church of Worcester and it remained a village until the late 12th century when it was developed into a town by lord of the manor, John of Coutances. John laid out a new plan in 1196 based on a grid system to expand Stratford. Additionally, a charter was granted to Stratford by King Richard I in 1196 which allowed a market to be held in the town. These two charters, which formed the foundations of Stratfords transformation from a village to a town, johns plans to develop Stratford into a town meant Stratford became a place of work for tradesmen and merchants. By 1252 the town had approximately 240 burgages, as well as shops, Stratfords new workers established a guild known as the Guild of the Holy Cross for their business and religious requirements. Cardiff is the capital and largest city in Wales and the eleventh-largest city in the United Kingdom. The city is the chief commercial centre, the base for most national cultural and sporting institutions, the Welsh national media. The unitary authority areas mid-2011 population was estimated to be 346,100, the Cardiff metropolitan area makes up over a third of the total population of Wales, with a mid-2011 population estimate of about 1,100,000 people. Cardiff is a significant tourist centre and the most popular destination in Wales with 18.3 million visitors in 2010. In 2011, Cardiff was ranked sixth in the world in National Geographics alternative tourist destinations, the city of Cardiff is the county town of the historic county of Glamorgan. Cardiff is part of the Eurocities network of the largest European cities, the Cardiff Urban Area covers a slightly larger area outside the county boundary, and includes the towns of Dinas Powys and Penarth. A small town until the early 19th century, its prominence as a port for the transport of coal following the arrival of industry in the region contributed to its rise as a major city. Cardiff was made a city in 1905, and proclaimed the capital of Wales in 1955, since the 1980s, Cardiff has seen significant development. A new waterfront area at Cardiff Bay contains the Senedd building, home to the Welsh Assembly, sporting venues in the city include the Millennium Stadium, SWALEC Stadium, Cardiff City Stadium, Cardiff International Sports Stadium and Cardiff Arms Park. The city was awarded the title of European City of Sport twice, due to its role in hosting major sporting events, first in 2009. The Millennium Stadium hosted 11 football matches as part of the 2012 Summer Olympics, including the opening event. Caerdydd derives from the earlier Welsh form Caerdyf, the change from -dyf to -dydd shows the colloquial alteration of Welsh f and dd, and was perhaps driven by folk etymology. 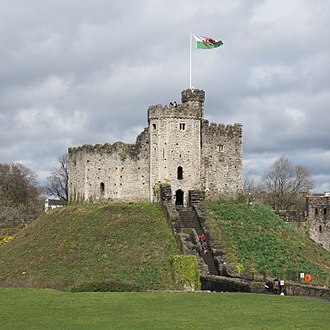 This sound change had probably first occurred in the Middle Ages, Caerdyf has its origins in post-Roman Brythonic words meaning the fort of the Taff. 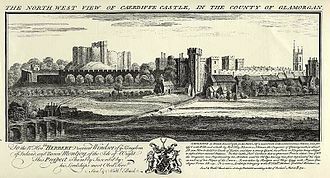 The fort probably refers to that established by the Romans, the anglicised form Cardiff is derived from Caerdyf, with the Welsh f borrowed as ff /f/, as happens in Taff and Llandaff. Oxford is a city in the South East region of England and the county town of Oxfordshire. With an estimated 2015 population of 168,270, it is the 52nd largest city in the United Kingdom, the city is situated 57 miles from London,69 miles from Bristol,65 miles from both Southampton and Birmingham and 25 miles from Reading. The city is known worldwide as the home of the University of Oxford, buildings in Oxford demonstrate notable examples of every English architectural period since the late Saxon period. Oxford is known as the city of dreaming spires, a term coined by poet Matthew Arnold, Oxford has a broad economic base. Its industries include motor manufacturing, publishing and a number of information technology and science-based businesses. Oxford was first settled in Saxon times and was known as Oxenaforda, meaning Ford of the Oxen. It began with the establishment of a crossing for oxen around AD900. In the 10th century, Oxford became an important military frontier town between the kingdoms of Mercia and Wessex and was on several occasions raided by Danes, Oxford was heavily damaged during the Norman Invasion of 1066. Following the conquest, the town was assigned to a governor, Robert DOyly, the castle has never been used for military purposes and its remains survive to this day. DOyly set up a community in the castle consisting of a chapel. The community never grew large but it earned its place in history as one of Britains oldest places of formal education and it was there that in 1139 Geoffrey of Monmouth wrote his History of the Kings of Britain, a compilation of Arthurian legends. Mary at Oseney and to the canons serving God in that place and we have made this concession and confirmation in the Common council of the City and we have confirmed it with our common seal. These are those who have made this concession and confirmation, a grandson of King John established Rewley Abbey for the Cistercian Order, and friars of various orders all had houses of varying importance at Oxford. Parliaments were often held in the city during the 13th century, the Provisions of Oxford were instigated by a group of barons led by Simon de Montfort, these documents are often regarded as Englands first written constitution. 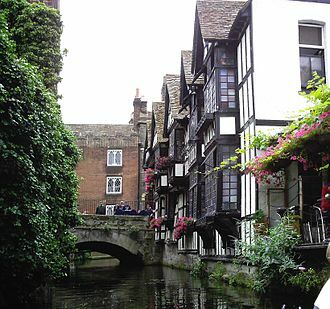 Norwich is a city on the River Wensum in East Anglia and lies about 100 miles north-east of London. 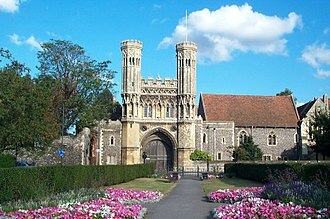 It is the administrative centre for East Anglia and county town of Norfolk. 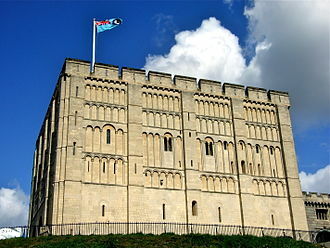 During the 11th century, Norwich was the largest city in England after London and it remained the capital of the most populous English county until the Industrial Revolution. The urban area of Norwich had a population of 213,166 according to the 2011 Census, the parliamentary seats cross over into adjacent local-government districts. 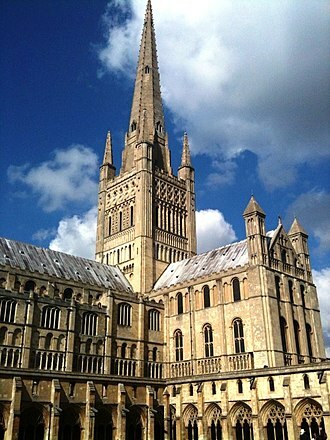 A total of 132,512 people live in the City of Norwich, Norwich is the fourth most densely populated local-government district in the East of England, with 3,480 people per square kilometre. 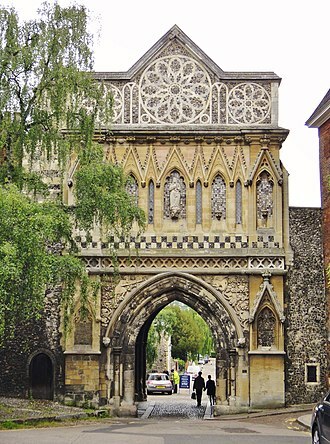 In May 2012, Norwich was designated Englands first UNESCO City of Literature, the capital of the Iceni tribe was a settlement located near to the village of Caistor St. Edmund on the River Tas approximately 8 kilometres to the south of modern-day Norwich. Following an uprising led by Boudica around AD60 the Caistor area became the Roman capital of East Anglia named Venta Icenorum, literally the market place of the Iceni. According to a rhyme, the demise of Venta Icenorum led to the development of Norwich, Caistor was a city when Norwich was none. There are two suggested models of development for Norwich, the ancient city was a thriving centre for trade and commerce in East Anglia in 1004 AD when it was raided and burnt by Swein Forkbeard the Viking king of Denmark. Mercian coins and shards of pottery from the Rhineland dating from the 8th century suggest that trade was happening long before this. Between 924 and 939, Norwich became fully established as a town, the word Norvic appears on coins across Europe minted during this period, in the reign of King Athelstan. The Vikings were a cultural influence in Norwich for 40–50 years at the end of the 9th century. 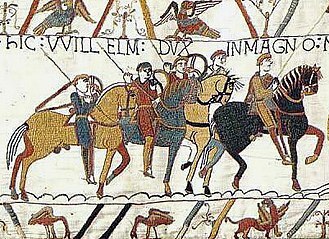 At the time of the Norman Conquest the city was one of the largest in England, the Domesday Book states that it had approximately 25 churches and a population of between 5, 000–10,000. 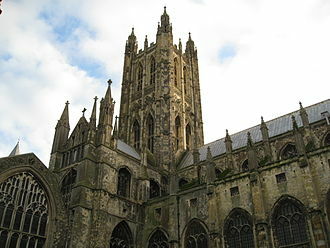 It records the site of an Anglo-Saxon church in Tombland, the site of the Saxon market place and the Norman cathedral. Abram Games OBE, RDI was a British graphic designer. The style of his work – refined but vigorous compared to the work of contemporaries – has earned him a place in the pantheon of the best of 20th-century graphic designers. In acknowledging his power as a propagandist, he claimed, I wind the spring, because of the length of his career – over six decades – his work is essentially a record of the eras social history. Some of Britains most iconic images include those by Games, an example is the Join the ATS poster of 1941, nicknamed the blonde bombshell recruitment poster. His work is recognised for its colour, bold graphic ideas. His father, who had emigrated to Britain in 1904, anglicised the name to Games when Abram was 12. Games left Hackney Downs School at the age of 16 and, in 1930, disillusioned by the teaching at Saint Martins and worried about the expense of studying there, Games left after two terms. He was fired from this due to his jumping over four chairs as a prank. In 1934, his entry was second in the Health Council Competition and, in 1935, from 1936 to 1940, he worked on his own as a freelance poster artist. An article on him in the influential journal Art and Industry in 1937 led to several commissions for Games, from the General Post Office, London Transport, Royal Dutch Shell. At the start of World War Two, Games was conscripted into the British Army and he served until 1941 when he was approached by the Public Relations Department of the War Office who were looking for a graphic designer to produce a recruitment poster for the Royal Armoured Corps. From 1942 Gamess service as the Official War Artist for posters resulted in 100 or so posters, Games was allowed a great deal of artistic freedom which enabled him to produce many striking images, often with surrealist elements. Among his first designs was the Auxiliary Territorial Service recruitment poster that became known as the blonde bombshell, the design Games replaced it with was criticised by Winston Churchill as being too Soviet. Other notable posters included Your Talk May Kill Your Comrades in which a spiral symbolising gossip originates from a mouth to become a bayonet attacking three of his comrades. The town hosts several festivals of culture, often featuring nationally and internationally famous contributors and attendees. As the home of the race of British steeplechase horse racing. Cheltenham stands on the small River Chelt, which rises nearby at Dowdeswell, as a royal manor, it features in the earliest pages of the Gloucestershire section of Domesday Book where it is named Chintenha. The town was awarded a charter in 1226. 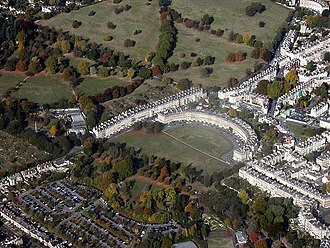 Though little remains of its history, Cheltenham has been a health. Captain Henry Skillicorne, is credited with being the first entrepreneur to recognise the opportunity to exploit the mineral springs, the retired master mariner became co-owner of the property containing Cheltenhams first mineral spring upon his 1732 marriage to Elizabeth Mason. Her father, William Mason, had little in his lifetime to promote the healing properties of the mineral water apart from limited advertising and building a small enclosure over the spring. 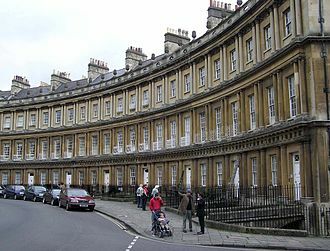 Skillicornes wide travels as a merchant had prepared him to see the potential lying dormant on this inherited property, after moving to Cheltenham in 1738, he immediately began improvements intended to attract visitors to his spa. He built a pump to regulate the flow of water and erected an elaborate well-house complete with a ballroom, the beautiful walks and gardens were naturally adorned with sweeping vistas of the countryside. Soon the gentry and nobility from across the county were enticed to come, the visit of George III with the queen and royal princesses in 1788 set a stamp of fashion on the spa. Cheltenhams success as a spa town is reflected in the station, which is still called Cheltenham Spa. Alice Liddell and Lewis Carroll were regular visitors to a house in Cudnall Street, horse racing began in Cheltenham in 1815, and became a major national attraction after the establishment of the Festival in 1902. Most of this materiel was reshipped to the continent for and after the D-Day invasion and his primary staff had offices and took residence at Thirlestaine Hall in Cheltenham. On 1 April 1974, under the Local Government Act 1972, four parishes—Swindon Village, Up Hatherley and Prestbury—were added to the borough of Cheltenham from the borough of Tewkesbury in 1991. The South Bank is an entertainment and commercial district of Central London, next to the River Thames opposite the City of Westminster. It forms a narrow, unequal strip of land within the London Borough of Lambeth. As with most central London districts its edges evolve and are informally defined however its central area is bounded by Westminster Bridge, both the County Hall and the Shell Centre contain major residential parts. South Bank is 800 metres southeast of Charing Cross, the pedestrianised embankment is The Queens Walk which is part of the Albert Embankment built not only for public drainage but to raise the whole tract of land and prevent flooding. In 1951 the Festival of Britain redefined the area as a place for arts and it now forms a significant tourist district in central London, stretching from the Blackfriars Bridge in the east to Westminster Bridge in the west. A series of central London bridges connect the area to the bank of the Thames Golden Jubilee. During the Middle Ages this area developed as a place of entertainment outside the regulation of the City of London on the north bank. By the 18th century the more genteel entertainment of the gardens had developed. The shallow bank and mud flats were ideal locations for industry and docks, there was a shift in use when the London County Council required a new County Hall, which was built between 1917 and 1922 on the south bank near North Lambeths Lower Marsh. The construction of County Hall returned the first section of frontage to public use. This was extended eastwards in 1951 when the Festival of Britain caused a considerable area to be redeveloped and it was renamed South Bank as part of promoting the Festival. The South Bank stretches two miles along the southern bank of the River Thames. The western section is in the Bishops ward of the London Borough of Lambeth, there are significant amounts of public open space along the riverside. Between the London Studios and the Oxo Tower lies Bernie Spain Gardens, named after Bernadette Spain, the South Bank is a significant arts and entertainment district. The Southbank Centre comprises the Royal Festival Hall, the Queen Elizabeth Hall, the Royal National Theatre, the London IMAX super cinema and BFI Southbank adjoin to the east, but are not strictly part of the centre. Urban design is the process of designing and shaping cities and villages. It is common for professionals in all disciplines to practice in urban design. In more recent times different sub-strands of urban design have emerged such as urban design, landscape urbanism, water-sensitive urban design. Urban design is about making connections between people and places and urban form and the built fabric, Urban design draws together the many strands of place-making, environmental stewardship, social equity and economic viability into the creation of places with distinct beauty and identity. Urban design draws these and other strands together creating a vision for an area and deploying the resources, Urban design theory deals primarily with the design and management of public space, and the way public places are experienced and used. Public space includes the totality of spaces used freely on a basis by the general public, such as streets, parks. Some aspects of privately owned spaces, such as building facades or domestic gardens, important writers on urban design theory include Christopher Alexander, Peter Calthorpe, Gordon Cullen, Andres Duany, Jane Jacobs, Mitchell Joachim, Jan Gehl, Allan B.
Jacobs, Kevin Lynch, Aldo Rossi, Colin Rowe, Robert Venturi, William H. Whyte, Camillo Sitte, Bill Hillier, although contemporary professional use of the term urban design dates from the mid-20th century, urban design as such has been practiced throughout history. Ancient examples of planned and designed cities exist in Asia, Africa and the Americas. European Medieval cities are often, and often erroneously, regarded as exemplars of undesigned or organic city development, there are many examples of considered urban design in the Middle Ages. 12th century western Europe brought renewed focus on urbanisation as a means of stimulating economic growth, the burgage system dating from that time and its associated burgage plots brought a form of self-organising design to medieval towns. Rectangular grids were used in the Bastides of 13th and 14th century Gascony, throughout history, design of streets and deliberate configuration of public spaces with buildings have reflected contemporaneous social norms or philosophical and religious beliefs. Yet the link between designed urban space and human mind appears to be bidirectional, the reverse impact of urban structure upon human behaviour and upon thought is evidenced by both observational study and historical record. There are clear indications of impact through Renaissance urban design on the thought of Johannes Kepler, the beginnings of modern urban design in Europe are associated with the Renaissance but, with the Age of Enlightenment. Spanish colonial cities were planned, as were some towns settled by other imperial cultures. These sometimes embodied utopian ambitions as well as aims for functionality and good governance, as with James Oglethorpes plan for Savannah, in the Baroque period the design approaches developed in French formal gardens such as Versailles were extended into urban development and redevelopment. In the 18th and 19th centuries, urban design was perhaps most closely linked with surveyors, much of Frederick Law Olmsteds work was concerned with urban design, and the newly formed profession of landscape architecture began to play a significant role in the late 19th century. The Lord President of the Council is the fourth of the Great Officers of State of the United Kingdom, ranking beneath the Lord High Treasurer and above the Lord Privy Seal. The Lord President usually attends and is responsible of presiding over meetings of the Privy Council, in the modern era, the holder is by convention always a member of one of the houses of Parliament and the office is a Cabinet post. The Lord President is currently David Lidington as of 14 July 2016, the Privy Council meets once a month, wherever the Sovereign may be residing at the time, to give formal approval to Orders in Council. Only a few Privy Counsellors need attend such meetings, and only invited to do so at the Governments request. As the duties of the Lord President are not onerous, the post has often given to a government minister whose responsibilities are not department-specific. In recent years it has been most typical for the Lord President to serve as Leader of the House of Commons or Leader of the House of Lords. Before the change of government in 2010, the Lord President was Peter Mandelson, examples of this practice are the meetings in New Zealand in 1990 and 1995, when Geoffrey Palmer and James Bolger respectively were acting Lords President. In the 19th century, the Lord President was generally the cabinet responsible for the education system. This role was gradually scaled back in the late 19th and early 20th centuries but remnants of it remain, a particularly vital role was played by the Lord President of the Council during the Second World War. The Lord President served as chairman of the Lord Presidents Committee and this committee acted as a central clearing house for dealing with the countrys economic problems. This was vital to the running of the British war economy. 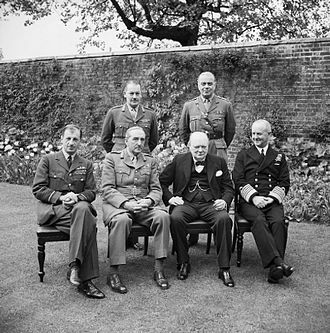 Winston Churchill, clearly believing that this wartime co-ordinating role was beneficial, introduced a similar, the so-called overlord ministers included Frederick Leathers as Secretary of State for the Co-ordination of Transport and Power and Frederick Marquis, 1st Baron Woolton as Lord President. Henry Thomas Cadbury-Brown RA was a British architect. He was educated at the Architecture Association where he was influenced by the architecture of Le Corbusier and Walter Gropius, after graduating he worked for architect Ernő Goldfinger and became his lifelong friend. He went on to set up his own successful practice and his involvement with the Modern Architecture Research Group led to friendships with other modernist architects and opportunities for work including the 1951 Festival of Britain. He is probably best known for his input into the Royal College of Art. Cadbury-Brown was born at Sarratt in Hertfordshire and boarded at Westminster School, from his childhood he was known as Jim after a family friend who had died in the war. Although there was pressure for him to join the Navy, friends suggested architecture as he had shown an aptitude for maths. At the behest of the architect F. R. Yerbury he enrolled into the Architecture Association in 1930 and his first design projects were quite traditional, but after his introduction to the work of Le Corbusier by a friend his work became much more modern. The German magazine Moderne Bauformen exposed him to German modernism and the work of Walter Gropius and he respected the simplicity of the German designs and their grounding in realism rather than the intectualism of other modernists. In 1934 as a fourth-year student Cadbury-Brown met Ursula and Ernő Goldfinger and was delighted by their furniture, after graduating he spent a year working at Goldfingers office and became an admirer of his work and lifelong friend. He learnt first-hand about the composition of materials and detailing and assisted with the design of Goldfingers Willow Road house and his first solo project came in 1937 when he won a competition to design two travel centres for the Big Four British railway companies. The buildings, one in Queensway and the other in the Strand, were praised by one of the competition assessors for their simplicity and practicality, on the back of this commission Cadbury-Brown set up his own office in Clarges Street, London. In 1938 he designed an exhibition stand at the Design and Industries Association at the British Industries Fair at Olympia and his friendship with Ralph Tubbs, whom he had met two years earlier upon joining the MARS Group, led to more work. They collaborated with another to design a bandstand in Weymouth for the MARS Group exhibition at the New Burlington Galleries and they went on to share offices and to design a display for the British Pavilion at the 1939 Worlds Fair. Like many of the designers at the MARS Group exhibition, Cadbury-Brown would be chosen by Hugh Casson to help some of the pavilions at the Festival of Britain. Also through this association with the group, he received work from Frederick Gibberd to design eighty houses in Mark Hall South as part of the Harlow New Town project. In 1947 the sixth meeting of CIAM was hosted by MARS in Bridgwater, Somerset, MARS at that time was under the leadership of the architectural critic J M Richards who set the theme of the conference to architecture that appealed to the Common Man. This combination of architecture with sculpture and populism was of great interest to Cadbury-Brown, when war broke out he was already an officer with the Territorial Army, in which he served as a major with the Royal Artillery. South Kensington is an affluent district of West London in the Royal Borough of Kensington and Chelsea and the City of Westminster. It is a built-up area 2.4 miles west- south-west of Charing Cross and it is hard to define boundaries for South Kensington, but a common definition is the commercial area around the South Kensington tube station and the adjacent garden squares and streets. Although the postcode SW7 mainly covers South Kensington, some parts of Knightsbridge are covered, neighbouring the equally affluent centres of Knightsbridge and Kensington, South Kensington covers some of the most exclusive real estate in the world. It is home to numbers of French expatriates, but Spanish, American. There are several French bookshops and cafes in the area and is sometimes referred to as Paris’s 21st arrondissement. Two London Underground stations are located in South Kensington, South Kensington, the area was largely undeveloped until the mid-19th century, being an agricultural area supplying London with fruit and vegetables. The area is the subject of Donovans song Sunny South Kensington, California was given that name in 1911 by Robert Brousefield, an American surveyor who at an ealier time lived in the British South Kensington. Notable residents have included, Sir Henry Cole, campaigner and first director of the South Kensington Museum, charles Booth, pioneer of social research, lived at 6 Grenville Place. George Wallis, FSA, museum curator and art educator and his children, including Whitworth Wallis and Rosa Wallis. Sir Herbert Beerbohm Tree, actor-manager, lived at 31 Rosary Gardens. Sir J M Barrie and novelist, author of Peter Pan, virginia Woolf and her sister Vanessa Bell and interior designer, lived at 22 Hyde Park Gate until 1904. Francis Bacon, Irish-born British artist, lived at 17 Queensberry Mews and 7 Reese Mews, benny Hill, lived at 1 &2 Queens Gate. Nicholas Freeman, OBE, controversial Leader of the Royal Borough of Kensington and Chelsea, lived in Harrington Gardens, dennis Gabor, electrical engineer and physicist, most notable for inventing holography,1971 Nobel Prize in Physics. Evening snow at Evelyn Gardens, South Kensington in 2010. Inland summer cloud development, July 2010, Stratford is denoted by the yellow dot. A sculpture of the Fair Maid of Perth, by Graham Ibbeson, sits at the east end of the pedestrianised High Street. It refers to the novel of the same name by Sir Walter Scott. The sundial of the Moot Hall. The Martello Tower viewed from across its bridge. The converted Fort Green windmill. Engraving of Inverness from A Tour in Scotland by Thomas Pennant, 1771. Cavendish House department store on the Promenade. 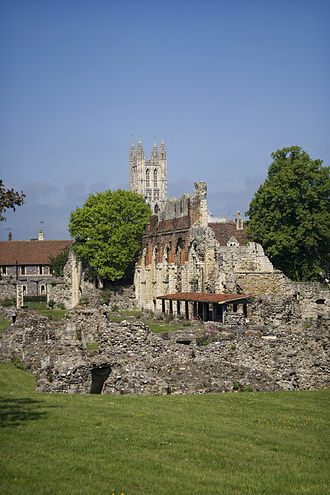 St. Augustine's Abbey, which forms part of the city's UNESCO World Heritage Site, was where Christianity was brought to England. Ebenezer Howard's influential 1902 diagram, illustrating urban growth through garden city "off-shoots"
Royal proclamation granting Lord Mayoralty to Oxford. Campania in Festival Dress at Plymouth Docks. We Too Must Defend Our Freedom, by James Gardner. War effort bombing scene by James Gardner. Festival of Britain, Pleasure Gardens, Battersea Park, London, UK.